Indian Staffing Federation through its regulatory committee is working on the 4th Code where CLRA will be merged. 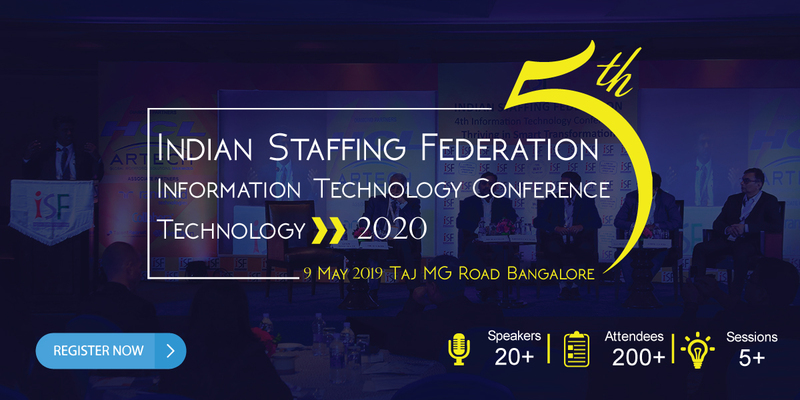 Shared his views on "What factors will be driving growth for IT staffing in 2019? " As the current government accelerates its agenda of job creation by bringing in foreign investments, staffing companies will step in to facilitate this process. What are the critical reforms that are required to make ‘Staffing’ a choice of employment? Shared his views on "How is Flexi Staffing bringing a new dimension to the workforce planning in your industry sector?" flexi staffing enabling higher deployment flexibility to either upscale or downscale manufacturing operations with a shorter lead time. ICICI Prudential Life Insurance Pvt. Ltd. Shared his views on "How flexi staffing is coming as a benefit to your company?" Shared his "Expectations from IT Staffing Companies"
1. IT staffing companies should be able to anticipate the skill requirements based on the technical advancements happening around. 2. IT staffing companies must come up with the innovative business models to support their clients. Shared his views on "Temporary Staffing"
He said temp staffing starts at home front in the disguise of home servant or maids etc. This is the exact mentality that’s carried forward in even larger companies where in there’s a divide between permanent and temp staffs. Shared his views on "How Flexi Staffing is coming as a benefit to IBM?" Shared his views on "What are 3 important things you are looking from flexi staffing employees?" Shared his views on "Flexi Staffing Industry"
Flexible staffing helps companies add to the workforce selectively and in specific areas. The primary reason that drives temporary staffing is that organizations today want to focus on their core business and hence want to outsource all activities that are not directly related to their business. Shared his views on "What are the parameters on which you select you staffing partner?" Shared his views on "What are the critical reforms that are required to make ‘Staffing’ a choice of employment?" More & more businesses will turn to flexi staffing & by 2020 it will be the source from where most businesses will get their manpower supply. Shared her views on "How is Flexi Staffing bringing a new dimension to the workforce planning in your industry sector?" When discussing the trends and flexi staffing needs in the tourism industry, it is always interesting to start with some facts and figures on the current situation of the industry. Shared his views on "Ways to grow the IT Staffing Industry?"